Are you looking for ethical and sustainable shoes? Me too. But the search for “good” shoes is easier said than done. In the process I stumbled upon dark reports on the shoe industry’s supply chain issues. Then I was dazzled by the bright images and eco jargon of “good” footwear brands. Organic, vegan, recycled, high-tech, fairtrade or “one for one” – how to make sense of it all? This guide is in two parts. Next week I will list some shoe brands pushing towards good and worth looking into. But today I address the elephant in the room: what is a sustainable and ethical shoe, really? I will break it down with four questions to ask yourself the next time you buy shoes. Consider yourself warned: there is no black and white answer. What makes a shoe ethical? While we are well accustomed to the terms ‘sustainable’, ‘green’ and ‘ethical’, it is not easy to translate these big words into concrete action. For there are the environmental, social and economic impacts to consider, and not only through production but also through consumption, use and waste. There are limits on available information, but also limits to the amount of information we can absorb as individual consumers. Demanding respect of human rights and a living wage for the workers who made your shoes is a perfectly fair request to set any shoe producer. Unfortunately, this demand is difficult to bring about in practice. Subcontracting production to suppliers abroad is just business as usual in the shoe and garment industry. This leads to fierce competition that pushes prices down. There are also many women who take part in the invisible workforce of home workers who earn poverty wages and retain no job security. As the average brand is the end station of complex and far-spread supply chains, it is challenging for them to have complete overview, not mentioning control, over their entire supply chain. The garment and shoe sectors in Eastern European countries are notorious for bad working conditions and poverty wages, according to the report "Labour on a shoe string" by the European collaborative initiative Change Your Shoes. In fact, the report states that there are European countries where workers in the shoe industry have about the same purchasing power as equivalent workers in Indonesia and China. A strange EU trade scheme, the "Outward Processing Trade" (OPT), makes it possible for Western European countries, like Italy, to export pre-cut materials to low-cost European countries for assembly and manufacturing. The shoes are then re-imported for the final stages of packing and labelling. See the illustrations below from the report "Labour on a shoe string", published 2016 by Change Your Shoes and the Clean Clothes Campaign. At this point you may be drowning in despair. There is hope: transparency. Why does transparency matter? Because brands that publicly publish a code of conduct, list their suppliers and report on sustainability issues make themselves open to public scrutiny. It means they can be held accountable for failures in their supply chains. Just as importantly, it implies they are making an effort to gain better knowledge and take greater responsibility for their products. Noticing a problem is the first step towards solving it. Yet transparency is not a solution in itself. In all practicality, it is impossible to trace where a pair of shoes were made on the basis of a brand's list of hundreds or thousands of supplier factories. Smaller brands dealing with fewer suppliers are easier to hold accountable. Presumably big brands with high turnovers and large market shares, have greater potential to push towards positive change. For instance, the Adidas Group had a €16.92 billion (€16,920,000,000) turnover in 2015, according to another report “Trampling worker rights underfoot” by Change Your Shoes. 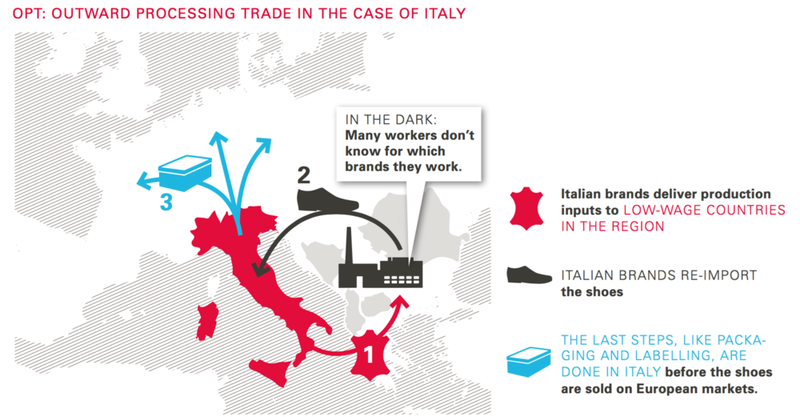 On the other hand, the Adidas Group’s products were produced in over 1,100 supplier factories spread over 61 countries. That means getting a complete overview over their supply chain a very difficult task to accomplish. Seeing that the big brands are the ones making the most money as things are, one could argue they are also the least likely to change the system and disrupt status quo. What about TOMs, you ask? They have made successful business on their “one for one” model, donating a pair of shoes to someone in need for every pair sold. Ten years in and they have given away 60 million pairs of shoes, but they have received some criticism concerning the effect of their donations. This paper published in the World Bank Economic Review found no significant negative effect on local markets of TOMs donations, but neither did the donated shoes make a big impact on the lives of the children who received them. Whether good or bad, the TOMs model addresses a symptom of poverty, rather than poverty itself. 2. What are the shoes made of? Choosing recycled materials seems a good option when looking for sustainable shoes. The Adidas Recycled Ocean Waste shoes, for instance, are made partly from drifting fish nets. The production of these shoes involve both reusing a waste material and clearing the ocean of nets that cause problems for dolphins, sharks and other sea animals. While shoes made of recycled plastic bottles and fish nets divert waste materials from landfills and oceans, they may contribute to another problem: micro synthetics seeping into our drinking water and food. Almost all materials pose some environmental challenges, but you can look for certifications like the fairtrade label, GOTS cotton and other multi-stakeholder initiatives. 3. How long will the shoes last? More than 24 billion (24,000,000,000) pairs of shoes were made in 2014, states the report “Trampling worker rights underfoot”. About 300 million pairs of shoes end up in landfills each year, according to this article, where the soles of most trainers are said to take up to 1,000 years to decompose. Recycling shoes is a challenge as they are typically made up of many different materials: cotton, synthetics, leather, rubber, metal and glue. Nike seems to be an exception to the rule on this point with their shoe recycling programme “re-use a shoe”. The resulting “nike grind” material is used for running tracks, and even garments, yarns and trims. Most shoes, however, will eventually be thrown out as waste. To slow down the waste spiral, choose well-made shoes of quality materials, that can be be repaired when worn down. One thing is clear: there is no easy answer. The number one thing you can do is to choose a pair of shoes that fit you well, both on your feet and with your lifestyle. Shoes you will want to use until they are worn out. Next, what is the best you can do given the restrictions you face? We all have some limits in terms of money to spend, time to research or access to better brands. Not everyone can afford shoes handmade in Western Europe or the US. Not everyone has the time or patience to read lengthy sustainability reports. And no one can change the whole system on their own. Aim for the 80% rule. It is hard to get it all right, both as consumers and producers. Even the best brands will falter and stumble upon their way. So will you and I. Do what you can when you can, and I am cheering for you!